HTC launched its new smartphone in desire series. 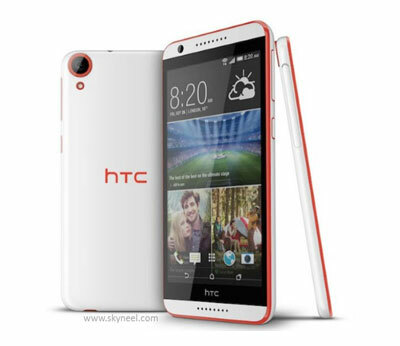 The HTC launched Desire 820 flagship phone which comes with 64-bit support. This phone is new variant of Desire 816. It has Octa-Core 64 bit Processor. This phone supports 4G LTE network. Although information about this phone’s is not given by company. This Phone introduced new face fusion software which will enhance photo quality. In this software real time photo makeup, photo fusion, photo preview etc. features are available. This phone has photo booth feature which will add many photos in one frame. Desire 820 is a Smartphone phone which is available in Dual SIM with 4G facility. Desire 820 available in different color variations like as Tuxedo Grey, Marble White, Santorini White, Tangerine White, Milky-way Grey, Saffron Grey etc. This phone comes with Octa-core processor with 2GB of RAM and an Adreno 405GPU. It has 13 MP with auto focus, LED flash facility on rear and 8MP front camera for selfie. Desire 820 has 5.5 Inches Screen. It has IPS LCD capacitive touchscreen with 1280 x 720 pixels Resolution. Its screen can display 16 million colors. In this phone 267 pixel per inch density is given. In This Phone HTC given HTC Sense UI v6 . This Phone has 13 MP Rear camera which gives 4160 x 3120 pixel photo quality. In this camera Auto focus, LED flash Geo-tagging, Face detection and HD video Recording is given. This phone has 8 MP front facing camera for selfie. This phone has octa-core (Cortex-A53 Quad-core 1.5 GHz & 1.0 GHz) processor which is very power and will give high speed. This phone may prove excellent in multitasking as it has 2GB RAM too. Desire 820 has 615 Snapdragon Chipset with Adreno 405GPU. It has 2GB RAM With 16GB ROM and user can expand memory up to 128GB via SD Card. Desire 820 runs on 4.4.2 Android Kitkat. The Smartphone has a compass, Accelerometer, proximity and Maps, Calendar, Google Search, Gmail, YouTube, Google Talk, Alarm, Calculator, Clock, and other Google sync apps. This is power pack with loaded lots of features and apps. Desire 820 has supports 4G, 3G and 2G (GSM) networks. It has Wi-Fi, Bluetooth, GPRS and EGPRS or EDGE. It has 2600 mAh battery which gives 22 hrs talktime. It also gives 424 hrs standby talktime. 1. The smarthpone has high speed Octa-core processor. 2. It has good Front camera for Selfie. 3. It has lots of RAM 2GB. 4. It has 64 Bit processor. 1. HTC Desire 820 has heavy weight. 2. It has Average Screen Resolution.